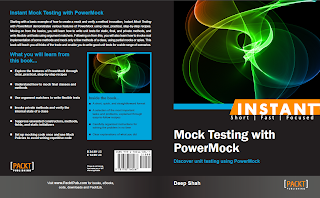 Here's some good news, I have teamed up with Packt Publishing and we are organizing a Giveaway for you to celebrate the release of my book and two lucky winners stand a chance to win an e-copy of Instant Mock Testing with PowerMock. All you need to do is head on over to the http://www.packtpub.com/mock-testing-with-powermock/book and look through the product description of this book and drop a line via the comments below to let us know what interests you the most about this book. Like all good things, this offer does not last for ever. The contest will close on 31/ 12/ 2013. Winners will be contacted by email, so be sure to use your real email address when you comment. Till we meet again, Merry Christmas and a Very Happy New Year!